A single LVTHX4 was built based upon the LVTPX2 cargo vehicle. It had a turret armed with the 105mm howitzer T96E1 in the mount T67E1. The vehicle was manned by a crew of seven with the driver and assistant driver in the front hull. Escape hatches were located in each side of the hull. Other hatches were provided for the driver and the assistant driver, the turret crew, and on the rear deck. The LVTHX4 was powered by the same two sponson mounted Chrysler V8 engines, each developing 200 gross horsepower. The sprockets drove the same T91E3 tracks with side wings as on the LVTP6. The loaded weight of the vehicle was 47,300 pounds for water operation and 49,300 pounds for operation on land. The maximum speed was 31 miles per hour on land and 5.7 miles per hour in water. Another prototype based upon the LVTPX2 was the LVTAAX2. Three of these vehicles were assembled by FMC. 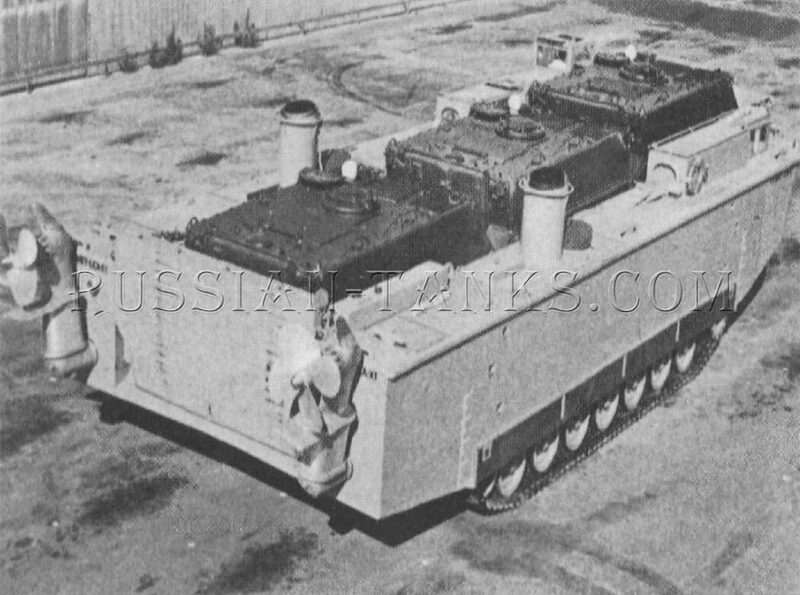 Basically, they consisted of the LVTPX2 cargo vehicle with the M4E1 twin 40mm gun turret installed. This was the turret normally used on the twin 40mm self-propelled gun M42. The vehicle performance was essentially the same as the LVTPX2. 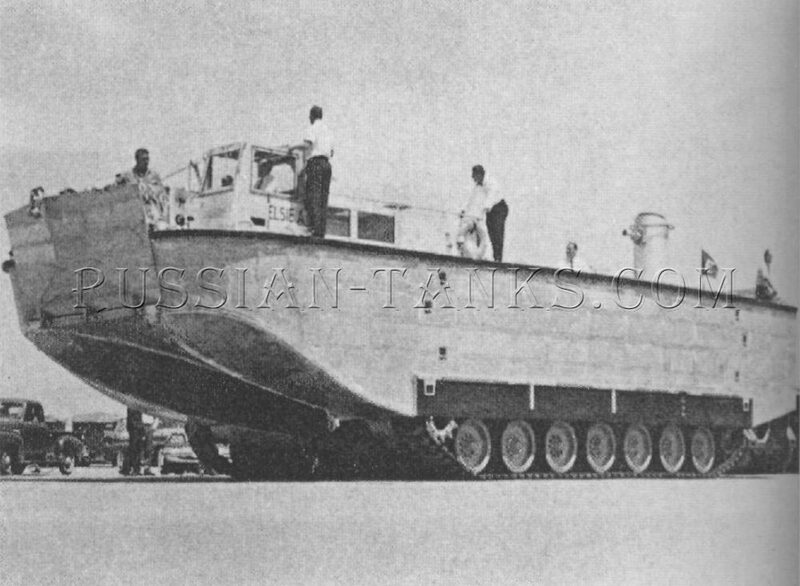 In 1951, the Bureau of Ships awarded a contract to the Pacific Car and Foundry Company to develop a large amphibious cargo carrier capable of transporting heavy vehicles and large quantities of supplies. Designated as the LYTUX2, it was completed in 1957. The steel hull was 1/8 inch thick with 3/8 inch thick steel armor on the crew compartment. The vehicle had an open top cargo well with the ramp in the front. Two 500 gross horsepower Continental AOS-895-3 engines were installed in the rear with Allison XT-1400 transmissions. The vehicle rode on four 36 inch wide tracks with each track carrying a set of 30 inch by 7.5 inch dual road wheels. The vehicle was supported by a torsilastic suspension. The weight of the LYTUX2 was 296,000 pounds including a payload of 120,000 pounds. 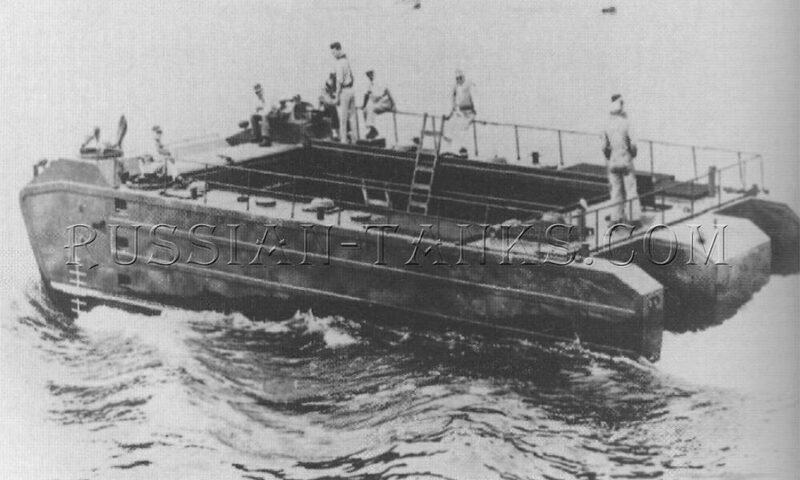 The maximum speed was about 13 miles per hour on land and 7 miles per hour in water (U.S. Army). 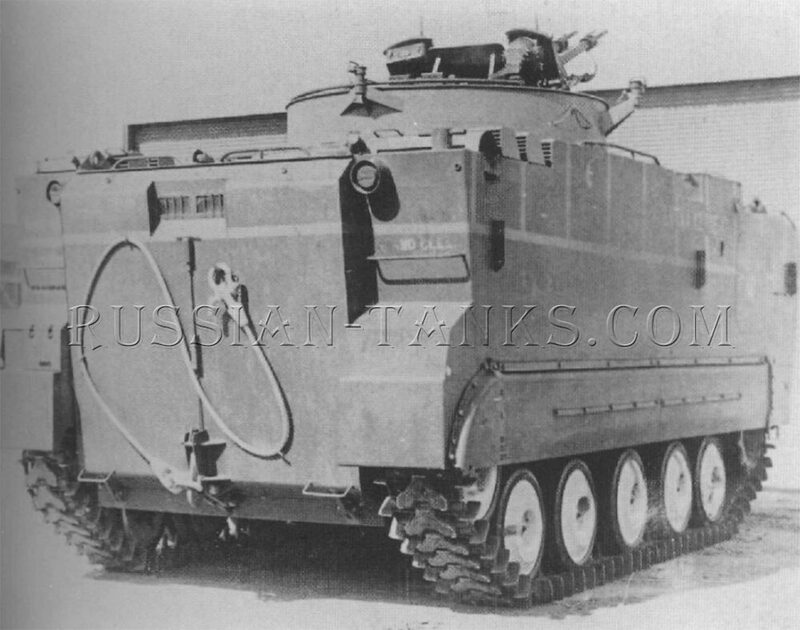 Development began at FMC in May 1960 of a lightweight, unarmored, full tracked, personnel and cargo carrier. 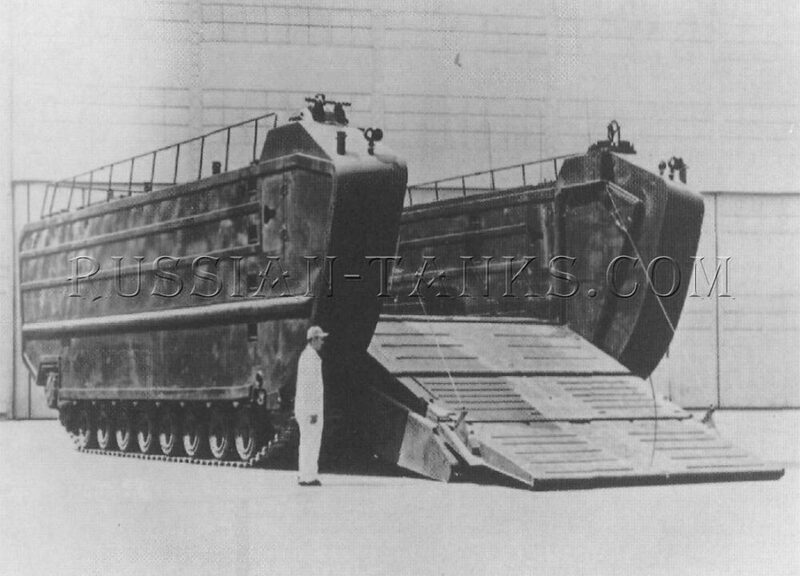 Referred to as a landing craft, assault (LCA), its official designation was the LCAX1. It was intended to transport 30 tons of cargo from landing ships to shore through rough water, surf, reefs, sand dunes, and other obstacles. The cargo was carried in a large, unobstructed, open top well deck that was closed at the rear by a ramp. Two large propellers, one on each side of the rear ramp, folded down for water propulsion. On land, they were folded up against the hull to prevent damage. The open well deck could accommodate three Ml 13 armored personnel carriers. After the outbreak of war in Korea during the Summer of 1950, a crash program was launched to produce a new LVT that would serve as the basis for a family of vehicles. The basic vehicle was to incorporate the best features resulting from the postwar development program. In December 1950, the Bureau of Ships selected the Ingersoll Products Division of Borg-Warner Corporation to serve as the central design agent on the crash program. Design studies began in January 1951 and the following August, the first production pilot drove off the assembly line under its own power. 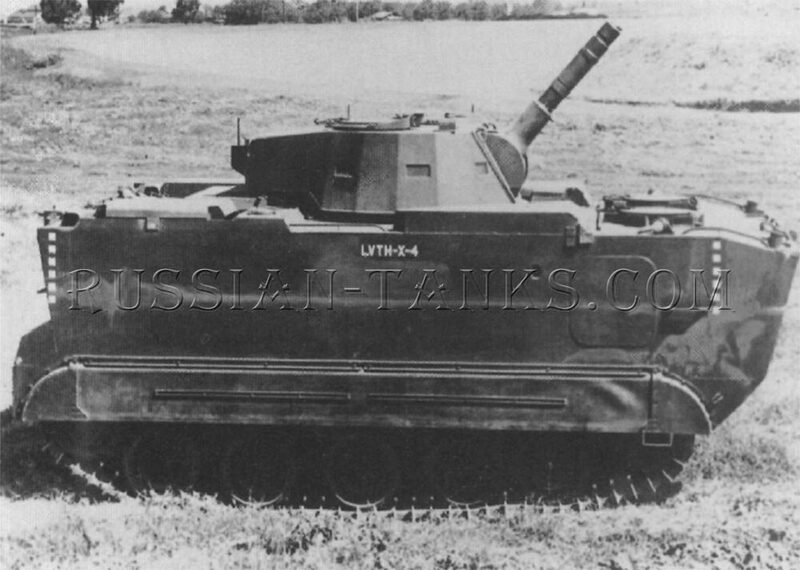 This was the LYTH6 armed with the turret mounted 105mm howitzer. It was the first vehicle of what was to become the LVTP5 family. 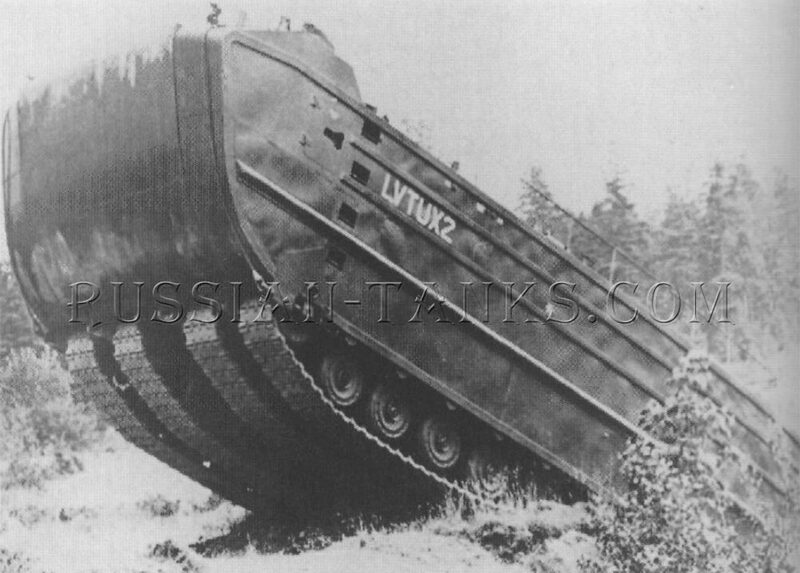 The LYTH6 was a large barge shaped vehicle with the hull assembled by welding steel armor plate varying from 1/4 to 5/8 inches in thickness. It had an inverted Y shaped bow and bottom for more efficient water operation. An hydraulically operated ramp was installed in the bow. This ramp was composed of inner and outer steel plates separated by equally spaced webs. The crew and stowage compartment at the forward end of the hull was separated from the engine compartment at the rear by a transverse bulkhead. The driver and the crew chief (assistant driver) were located under cupolas with five periscopes at the front on the left and right respectively.